Hop on over to Liza's Place for a really fun interview. A really nice review for, A MAN TO TRUST. What is your favorite pastime, other than writing? Walking, gardening and reading. When did you first get the writing bug? I can’t claim it came and stayed, I kept trying my hand at it, then life would get in the way, so it would be a while before I tried again. It was the mid ‘90’s when I really gave it a go and around 2006 when things began to take shape. What is a typical writing day for you? Sorry I don’t get to do typical. I do try to write every evening, but even that is often disrupted. What genre or genres do you write? Contemporary and Regency romances. Do you see yourself trying any another genre in the future and if so which one? Light paranormal. Tell us about your latest release? 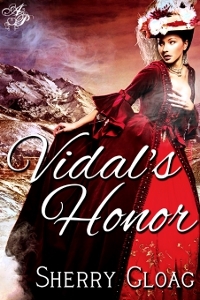 Vidal’s Honor is a Christmas Regency romance about spies, wars, betrayal and love. It is about overcoming all the odds and trusting others to be there for when they are needed the most. And not giving up or giving in even in the darkest moments. wonders which she will lose first, her head or her heart. What makes your hero special? He’s patient and yet tenacious. He’s only loved once, and lost. Now he has another chance he doesn’t intend to lose this time round regardless of the setbacks. What makes your heroine special? She is kind, generous, compassionate, and had to make a terrible decision that would make someone she loved unhappy. Now she has another chance, if she can live long enough to bring it about. What book are you reading now? This afternoon I finished Karen Swan’s, The Perfect Present. It’s over 500 pages long and I resented having to put it down to get some sleep. What inspired you to write your latest story? I was asked to write a Christmas story by a fellow Astraea press author, was given nearly seven months to write it. I ditched several false starts before I knew Vidal’s Honor was the one, by which time I had eight weeks left and the final edits of another book on my hands. The story starts out in Spain just hours before the battle of Salamanca and ends up in a ballroom in London on Christmas Eve. Tell us what excites you about writing and getting published. The exciting thing about writing is meeting your characters and discovering how the story plot unfolds. I’m not a plotter, so quite often the twists and turns surprise me and that’s always a challenge. Being published? To begin with it was the thrill of knowing I’d ‘done’ it. Could see my name ‘out there’, but now it is more about the readers, and writing for them and with them in mind. I still write for myself, but I love receiving reader-feedback too. Many of their comments are so enlightening and go influence future writing. What’s your current WIP? I have three WsIP, none of which are going smoothly! LOL The two remaining Gaquet princes keep changing the plot, and I’m almost at the point of calling their bluff. Two characters from Vidal’s Honor also want their story told, and to begin with we were up and running, but they too keep running off the rails, so I’m not sure whether that one will ever see the light of day. There are several ideas hovering, but one of them would be a major project and I have to decide whether I want to commit to it or not. Tell us about the first time you each other. Charles, Viscount Vidal – The Honourable Honor Adversane, as she was then, was one of my cousin’s bridesmaids. I knew in that instant she’d become important to me, but failed to realise in time just how important. Honor, Lady Beaumont - *blushes* I’m afraid I did not notice Charles at that wedding. I was so shy that at the first opportunity I tried to make myself as inconspicuous as possible. Charles – If that was your intent, your failed miserably, I couldn’t take my eyes off you the whole evening. So much so that Dev promised to introduce you to me. Charles – *Takes her hand in his* You are right it was another twelve months before he made good on his promise. Charles – Look at her. You don’t need me to tell you. One look and you will understand. It’s not her beauty, at least not her physical beauty. It’s what Honor is inside that drew me to her. One look at those eyes and I was lost forever. Charles – It’s alright, I understand. Charles – But we are together now and are to be wed in less than twenty-four hours. Honor – *Sighs, turns Charles’ hand and snuggles her cheek into his palm. Charles – She has the biggest heart of anyone I have ever known. Honor – His love for me. Honor - *on a gurgle of laughter* How can you describe it as a small, quiet wedding when Prinny will be there, along with the Earl of Wellington and so many of his soldiers? *She sighs,* But, only the people that matter most to both of us will be there, she elaborated, then stood, looked to those unseen readers and smiled. Thank you Cheryl for inviting me, Honor and Charles to visit with you today.